Halloween is just around the corner! What are you dressing up as? What will you kids be? We are thinking of maybe a theme and we can all dress up. I am excited for Halloween this year since my son is old enough now to get into the fun of it. So fun! He has been practicing spooking me too. He will jump out and yell or growl to scare me, so cute!! 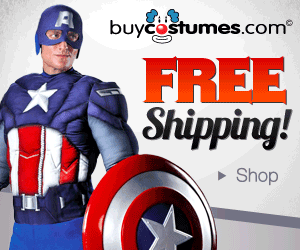 BuyCostumes.com is having a FREE Shipping sale. Be sure to check out their costumes before all the good ones are gone!